Sakura Watch, April 1, 2017 - blossom buds begin the next stage of development. Green tips are more obvious across many blossom buds and demonstrate the progress is slowly moving along. Weather continues to be a critical factor in how the buds transform into the beloved sakura cherry blossoms. Due to this yo-yo mix of warm and cold weather, it continues to keep things moving along slowly. One bright side is that the temperatures continue to stay above freezing which helps to prevent any bud damage. Close up photos of the buds confirm the beginning of the next stage when we see bright green tips with a hint of deep pink. Also worth noting is that the cherry blossom bud shapes appear full and round which is what we would like to see. These are both great indicators that the buds are healthy. 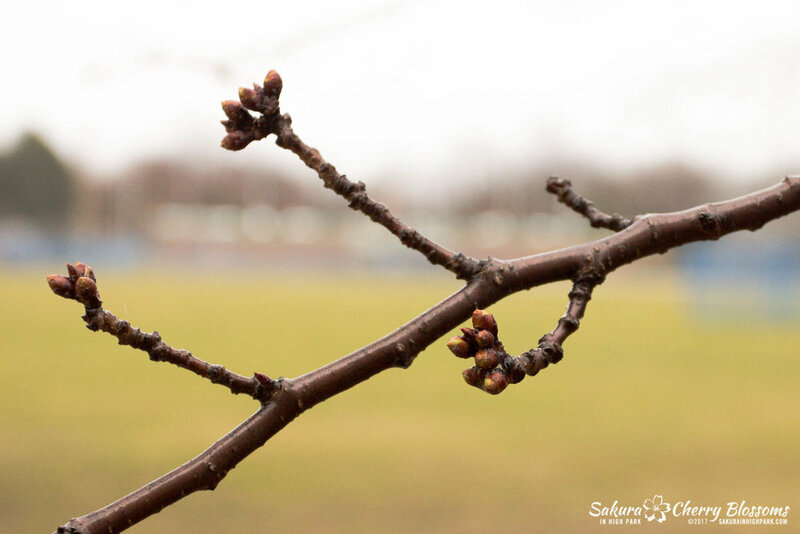 Remember in 2016 around this time we saw many buds that were thin and oval shaped including some that were already going to leaves. In comparison, buds in 2015 were further behind and only starting the first stage. So with the start of the next stage, this all signals more clues that 2017 is looking like it will be a 'normal' year with the blooms occurring in the first weeks of May. The next couple of weeks will be telltale in determining exactly when to expect the cherry blossom bloom. Watch for more updates to come!